For the first time ever, the TPLf regime had allowed rally by Eritreans in Addis Ababa in support of the UN Commission of Inquiry report on Eritrea. But this rally was a must for TPLF regime and has came with unwarranted warning, mainly to Eritreans who live as refugee in the capital Addis Ababa. A confidential circulars were put out six days before the rally as "urgent and emergency" to selected Eritreans who are trusted by the regime. The message was delivered by top TPLF cadres in Harambe hotel, Addis Ababa, at the conference room, on Saturday June, 20 between 7:30pm - 10pm local time. The confidential and conditional message put out by the TPLF to few ringleader Eritreans said "should any Eritrean refugee that temporarily lives in Addis Ababa fails to participate in the rally will be subject to non-renewal of his/her temporary residential ID, and if he/she have any future travel plan out of the country, it would be prohibited from exiting through all ports of entry. It also warns that all those that will participate in the rally will be registered and their names sent to immigration office to support their "clearance documentation". The message was conveyed to all Eritreans a week earlier, and this has created fear among the Eritrean refugees. Subsequently, before the rally begins, the refugees start passing on their full names to get a new temporary ID number as an evidence of compliance. They have been told, these new numbers should reconcile with the list of names that passed to the immigration office when time for clearance comes. Whether the TPLF regime will make this as requirement to leave through Ethiopian airports will remain to be seen, however, it managed to draw hundreds of Eritrean refugees to come out from their homes to the rally fearing retribution. Simultaneously, the Ethiopian Embassies across Europe also successfully recruited and organized clandestinely Ethiopians of Tigray origin to help supporting the UN commission of Inquiry report on Eritrea in Geneva masquerading as Eritreans . 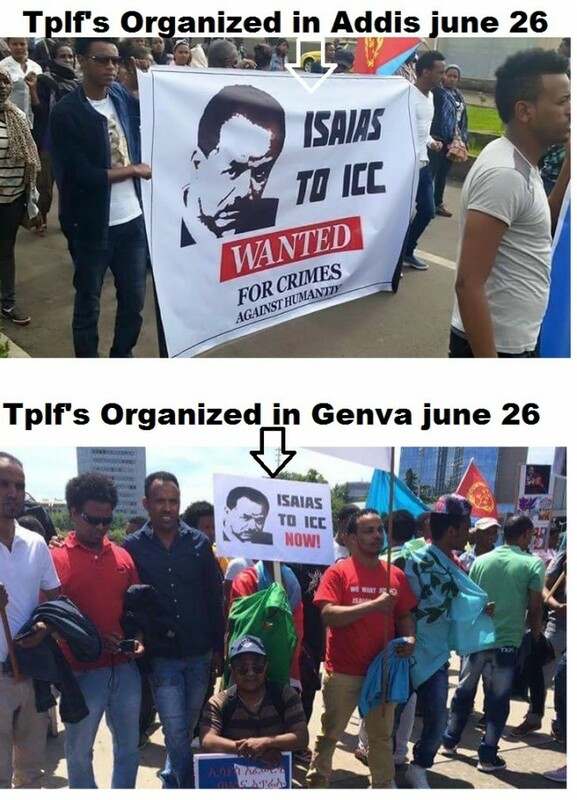 The TPLF consulates across Europe has organized buses, Eritrean flags and 180 Euro ($250 US dollars ) cash allowance for each Ethiopian who travel to Geneva . Sources said, only few key trusted members of Eritrean "oppositions" were informed and knew of this confidential arrangement, but the information has leaked day after the rally when some Eritreans were discussing of an isolated incident happened at the rally area before the rally begins on June 26, 2015. Witness confirm three die hard TPLF supporters who have traveled as Eritreans brought the Ethiopian flag and this has created few confusion and dissatisfaction among Eritreans, but the organizers quickly confiscated the flag and prevented from being displayed broadly. Nevertheless, the rumors spread quickly after the end of the rally and became a table discussions among Eritreans at the evening dinner party. Some were not happy but other say "whatever it takes" to overthrow the government of Eritrea! The TPLF financed buses left immediately after the rally, as a result the number of the participants that are left at the dinner party was drastically low. By looking at poured glass with drink no one can tell whether it was coke or Pepsi, so what the Europeans have seen at the rally were all Coke or Pepsi plus Coke? All Eritreans or mixed with Ethiopians? Having said that, little do we know that they may knew even about the conspired truth. NOTE: The above information is extremely credible and came from trusted organizers, I decided to remain unanimous for my personal safety reason.